Wash and dry lamb cutlets well. Blanch in hot water for 2-3 minutes, then drain and season with marinade. Drip in beaten egg white and roll in breadcrumbs. Pat the crumbs on firmly. Line a rack with greased aluminium foil and arrange the cutlets over. Grill over preheated oven at 200°C for 6-7 minutes each side. Grill sweet corn pieces for 8-10 minutes. Sprinkle with a dash of freshly ground black pepper. Toss salad leaves and fennel with a mixture of lemon and olive oil. 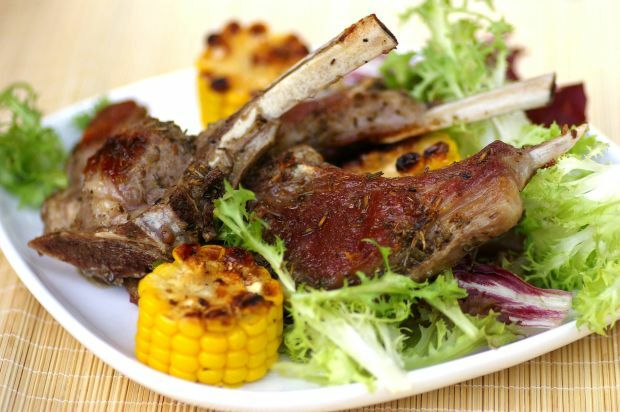 Serve condiments with the grilled lamb cutlets.